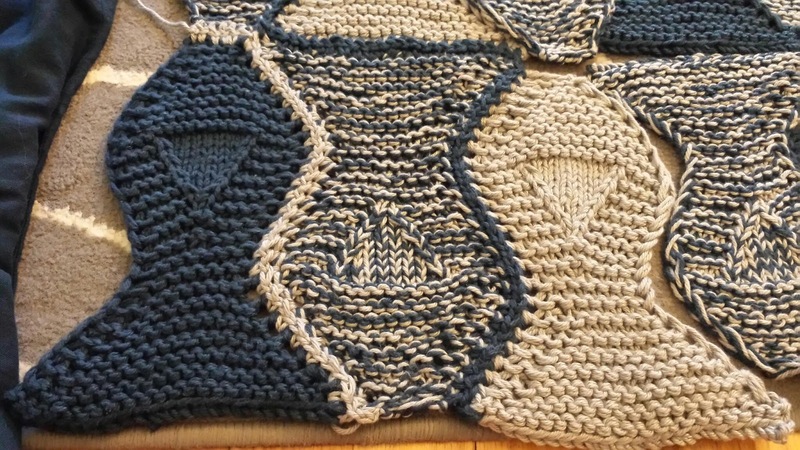 It can be awkward getting a request for a particular knit item. Sometimes it is hard to say yes to the asker, but other times what the person asks for is exactly what you wanted to make anyway! I've been wanting to make some kind of throw blanket for my in-laws, so when they moved into their new house and requested an afghan to go with their decor, I was thrilled to accommodate them. 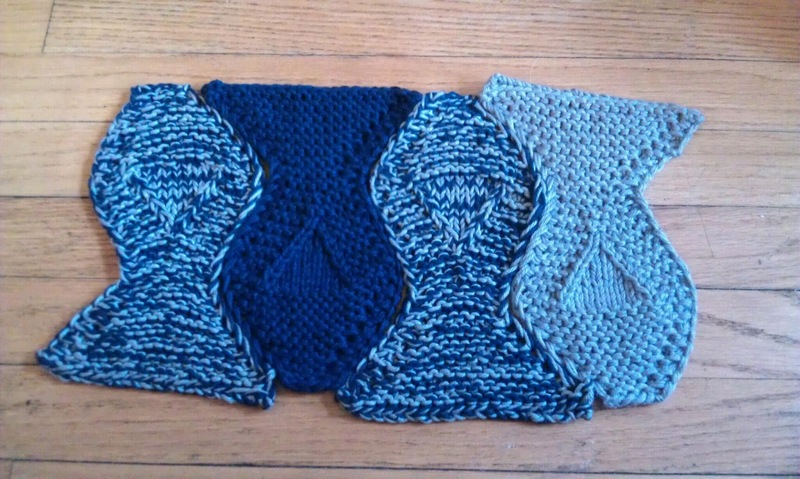 My MIL selected the pattern, a recipe for fish, and colors from swatches that I gave her last Christmas. Now all I had to do was finish the blanket. 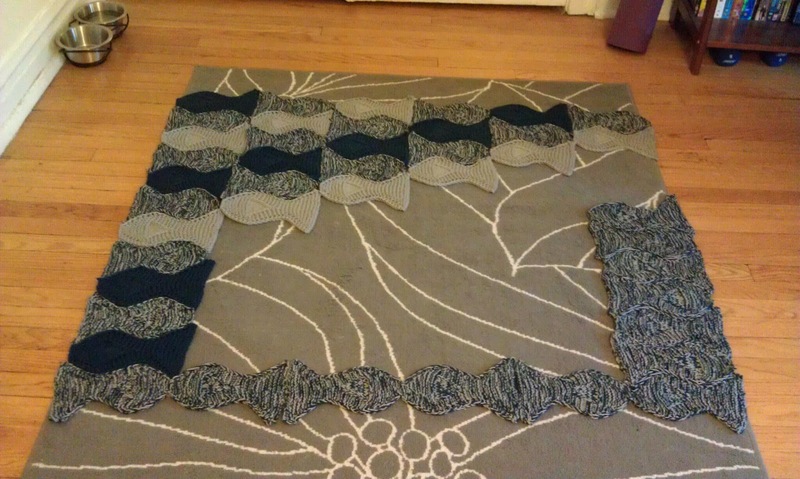 I tested the fish out before I calculated how much yarn I would need (See A Test Fish). I decided to go with 10 needles and 34 balls of yarn. 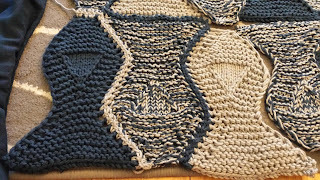 The blanket will have three colors made out of KnitPicks Comfy Worsted Yarn (Affiliate Link): Whisker (grey), Planetarium (navy) and a mix of the two colors. I printed out the pattern and put it on a piece of construction paper. With over 70 fish to create I know I will be referring to this a lot! August - 26 fish I knit the last fish on August 31! Way to go me! 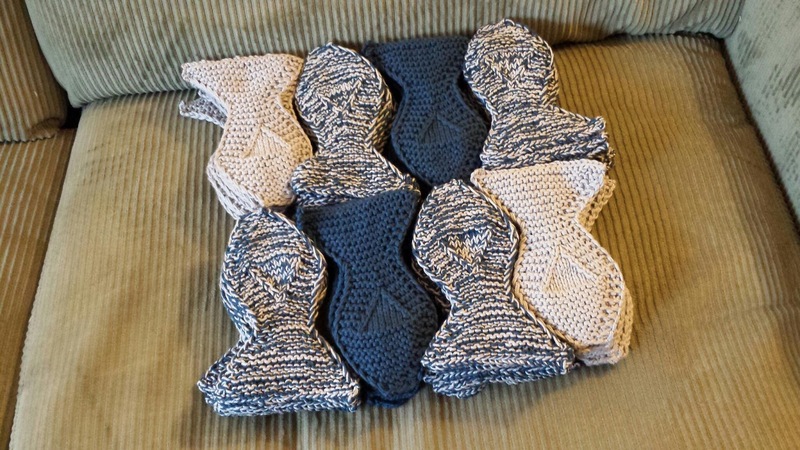 Midway through June I started knitting a fish a day that I was at home. I found this to be a great way to get many fish done without becoming bored or frustrated by the project. I am well on target to finish this blanket by my deadline. I'm so happy I made my goal of 20 fish in June! 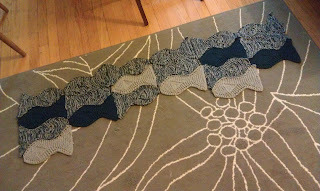 I will make a few more before the month is over, but I am well on track to finish this by the time the baby gets here. After 14 wrappers, I had completed 32 fish with enough yarn for an extra half of a fish. 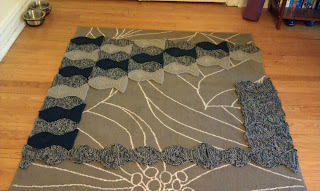 Given that I have 20 balls of yarn left, I think that I am on target to finish this project with yarn to spare. I just need to average 2 fish/ ball of yarn and I'll hit my 72! 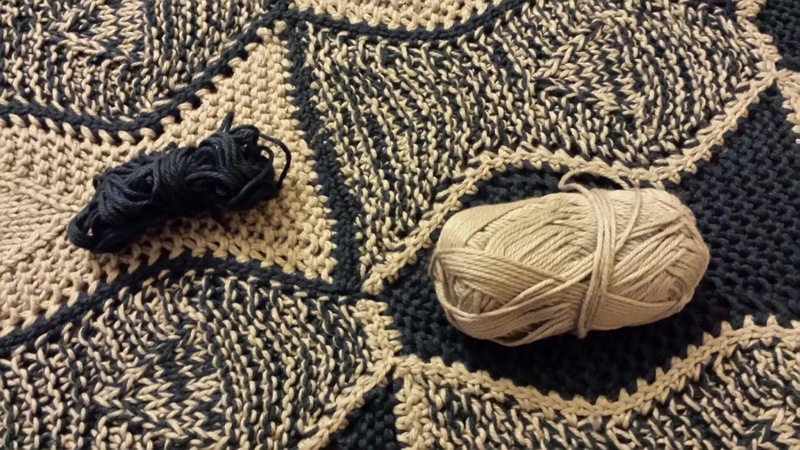 This is a great feeling, since I know I'll need some extra yarn to stitch the blanket together. As August began, I knew that I wanted to try to keep up with my one fish a day goal as much as possible. By the end of the month, I realized that I would come very close to finishing the remaining 26 fish that I had left. 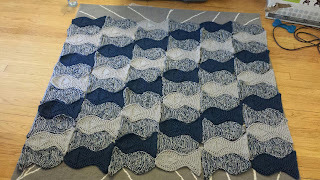 On August 31 I completed the 72nd fish, and was ready to start piecing the blanket together. 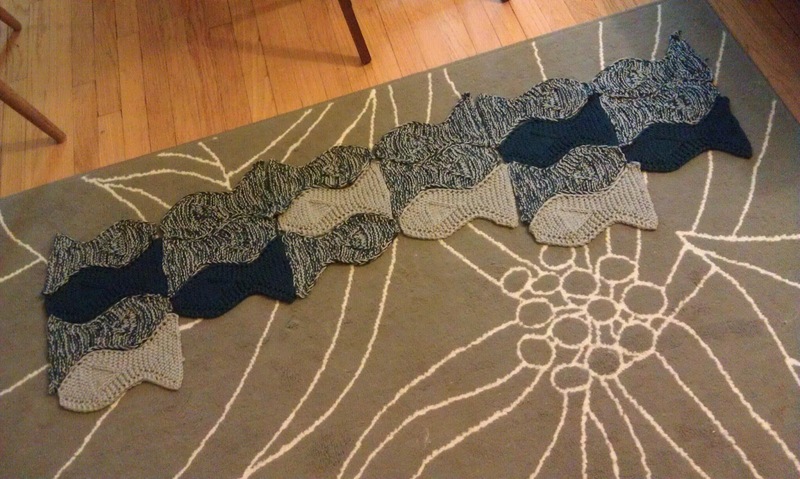 I decided that I wanted to crochet the fish together using a single strand of yarn. I would use the blue between the two color and grey, and grey between the two color and blue. I decided to try a crochet based technique first because I wanted to be able to assemble this blanket without needing to cut long pieces of yarn and whip stitch, I thought it would be cleaner. 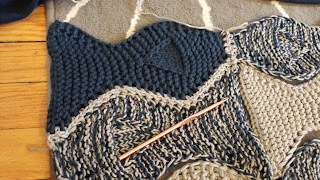 My plan for attempt 1 is to alternate making single crochet stitches with a single strand of yarn on alternate fish and see where that goes. I selected a size H hook (5.0 mm) to do this. This is slightly smaller than the 10's that I used for the blanket, but I think it should suffice. I wish that I has weighed the yarn before I started the crochet join... this way I would know how much I would need if I end up needing more yarn. I certainly have at least 1.5 of each color, definitely 1.5 blue and at least 2 grey. I did not get as far as I thought I would on Labor day, I only completed in securing 5 diagonal rows together. This is slow going,, but I am REALLY happy with the way the contrasting joins are working out. 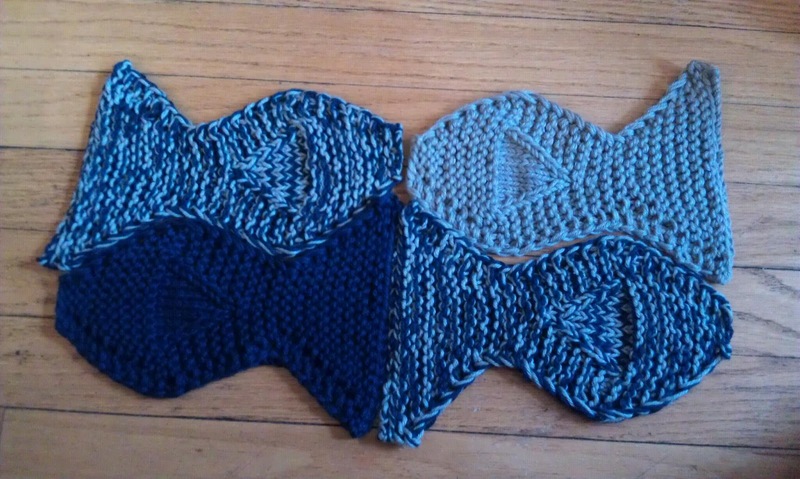 I eventually finished the scraps of blue yarn from the first 16 balls of blue yarn. The 17th blue ball weighs 50 g. At this point in the joining, I am almost 50% done with the blue yarn. 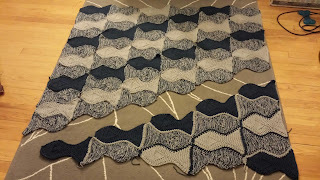 I know that I will have enough to join all of the fish together (since I started with less than 1 blue ball, and there are more grey scraps than blue), the question is whether I will have enough to crochet a border around the entire blanket. 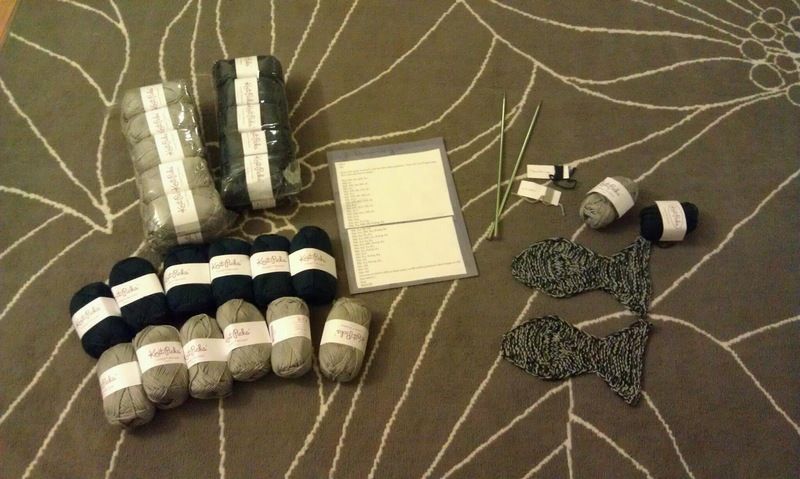 I may need to order one more ball of yarn, but we will see. Thankfully I have plenty of time to finish this project as it is only the beginning of September. 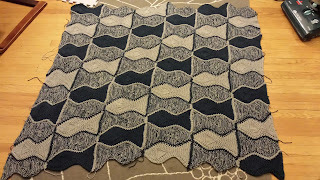 I started the last full grey ball at the beginning of the last big blue fish diagonal row. (The other scrap is enough to secure the very last fish.) 31 g remain of this after both ends of the blue row are secure. I'm feeling concerned that there would not be enough of this for a border either, so I think I will likely purchase one more blue and one more grey ball. 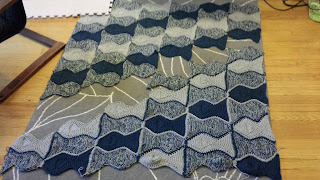 At the end of the blanket, I have 7 g of the blue yarn, I will DEFINITELY need more for the border. I really hope that 1 of each is enough! 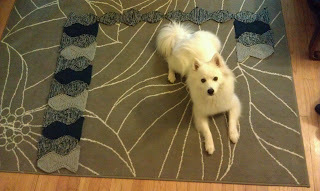 I worked on weaving in all the loose ends from joining while I waited for my new yarn to arrive. This way, when I finish the border I really finish the blanket! When the new balls arrived (52 g of blue and 51 g of grey), I started crocheting the border with the new balls. I wanted to avoid multiple loose ends if I could help it so there would be a streamlined continuous border out of both colors held together. 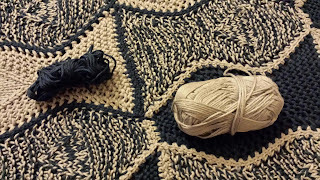 I used an I (5.5 mm) crochet hook for the task of a SC border holding one strand of each color together. The border consumed 25 g of blue and 25 g of grey. I'm glad that I ordered extra yarn! You can't tell from any of the pictures, but the edging doesn't lay perfectly flat when you just lay out the blanket. 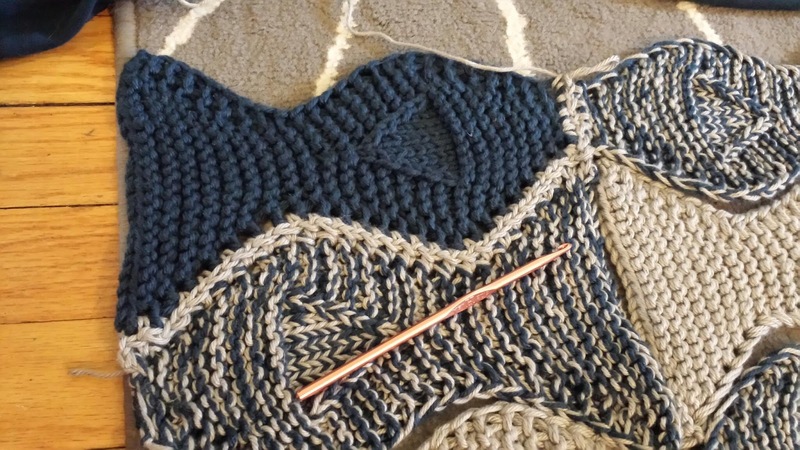 I think I like the blanket better with edging than without, but it bothers me on a perfectionist level. 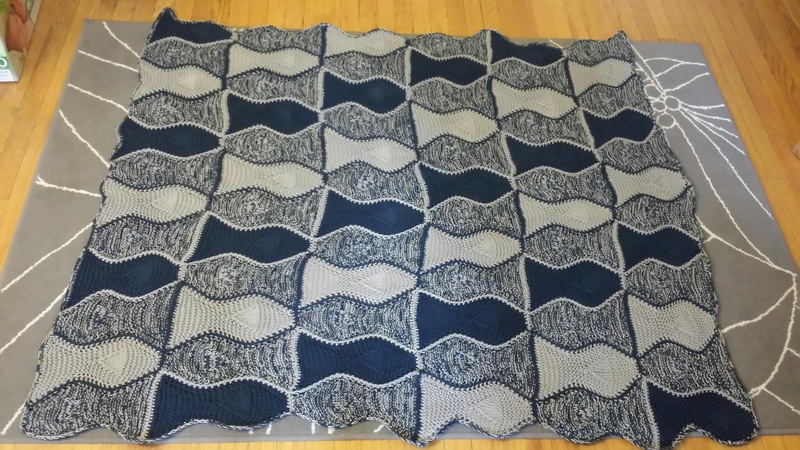 I decided to lightly block the blanket (lay it flat and wet it with a spray bottle) so it would lay better when I give it as a gift, but I know that it will get washed at some point and that my in-laws aren't likely to block it each time they wash it. Finished dimensions 54" x 49" (the longer dimension is from nose to tail, the smaller from side to side.) The project used about 17.5 balls of each color, 875 g/1907 g each. This is 3814 yards! 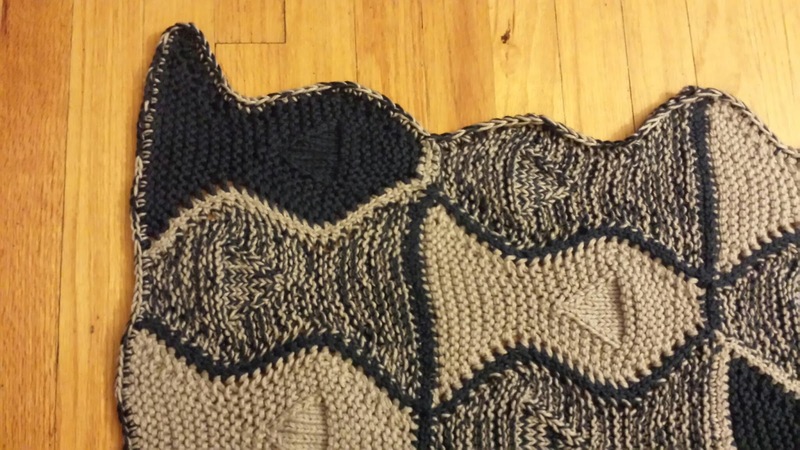 KnitPicks Comfy Worsted yarn lives up to its name, the blanket is super comfy and snugly. I am very happy with the finished product, even with my edge curling concerns. I know that it will be well loved by my in-laws! 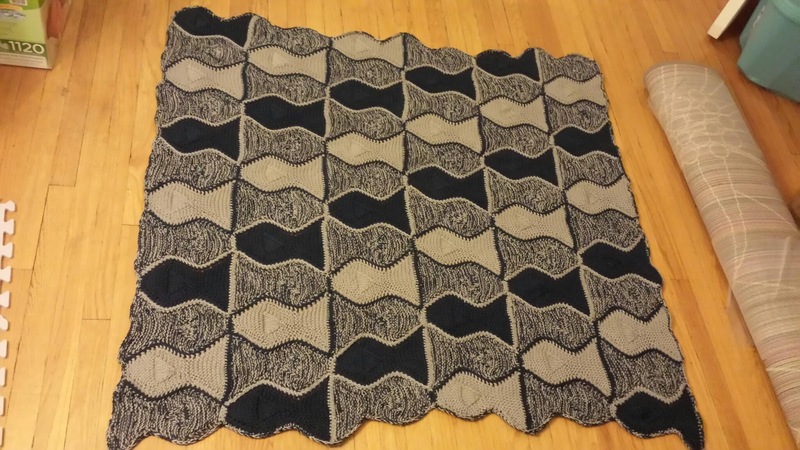 I'm also happy to say that I finished this blanket exactly a month before my due date. 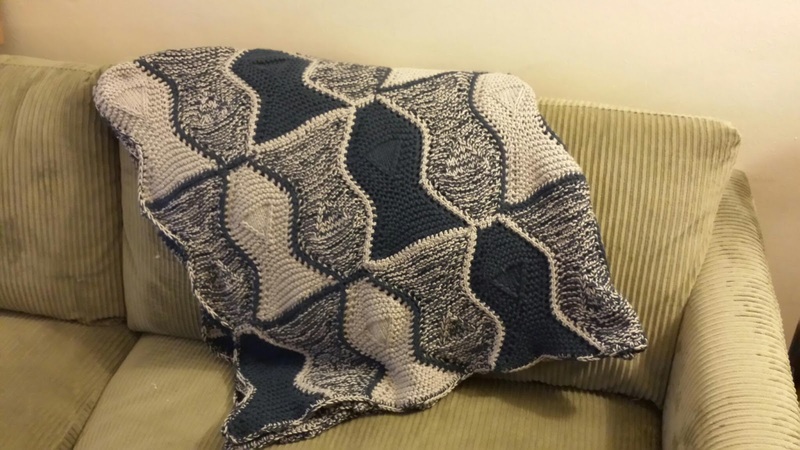 I like loved ready about your adventure in making this amazing blanket. You absolutely did an amazing job. Now I think I'm going to start one on Jan 1, 2018. Not sure who it's going to. Maybe I'll keep it. I'm a big Saints fan. Haha. It's BEAUTIFUL. GREAT JOB. YOU SHOULD BE VERY PROUD OF YOURSELF!!!!! !